Albert, a fully repaired Elsie-Dee, and the Hunter in Darkness all return in this issue, with the latter joining Albert & Elsie-Dee as they leave the Morlock Tunnels aboard the stealth bomber that Albert crashed in issue #40 and has been subsequently repairing. Mystique appears in this issue as well. Last seen reconciling with Rogue in X-Factor #70, in the wake of the Shadow King's attack, she seduces Wolverine (though he claims to have recognized her scent) and then expresses fear regarding Spiral, who proceeds to pop up on the very last page. Andy Kubert, still about a year away from becoming the regular artist on X-Men and still doing one-off work for the X-office, fills in this issue. Marc Silvestri returns next issue. 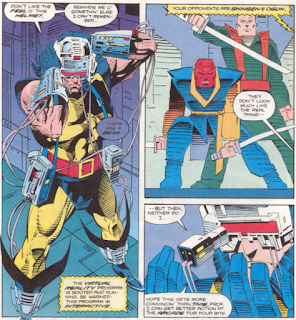 Masque appears briefly in this issue amongst the Morlocks, prior to his appearances in X-Force starting with issue #6. Spiral appears here after her appearance in X-Men #5. Following up on the idea introduced last issue, this one spends a lot of time emphasizing the point that Wolverine is becoming wilder and more out of control as a result of his exploration of his past, with Professor X pondering if this isn't Wolverine's true personality, the more tame one the X-Men have experienced being a result of the memory blocks placed on his mind. 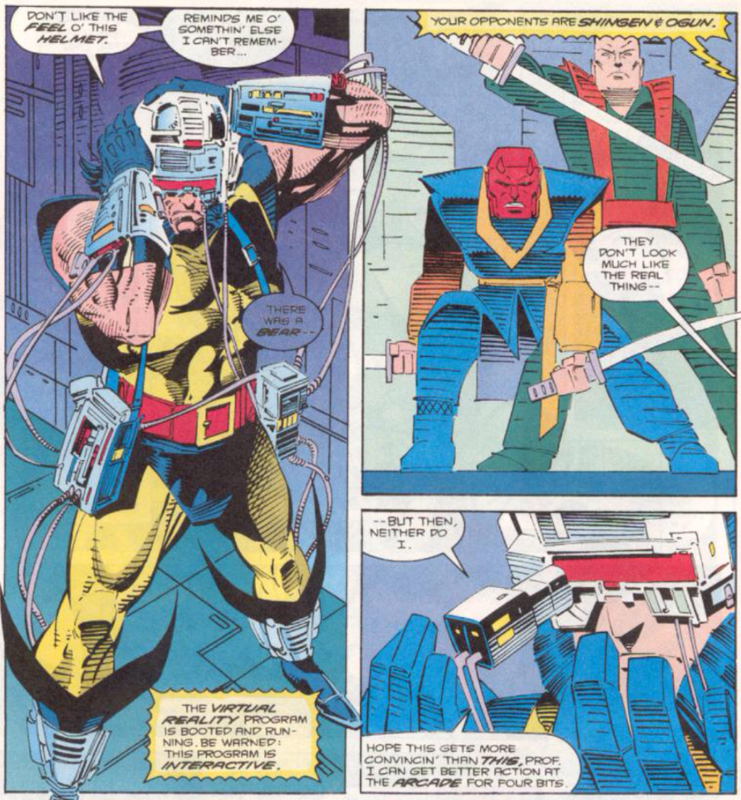 Professor X asks Wolverine to don a virtual reality helmet and gear that is highly reminiscent of the gear he wore in "Weapon X". I'm also not entirely sure what the VR equipment can do that the Danger Room can't. 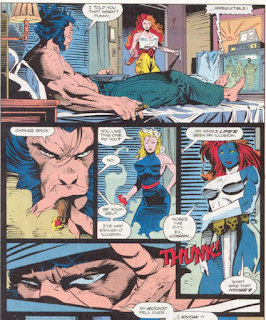 It seems pretty clear that Wolverine slept with Mystique in this issue, though it's less clear if he did so while she looked liked Jean Grey. Either way, the idea of Mystique posing as Jean and attempting to seduce Wolverine gets used in the second X-Men film as well. This issue kicks off another formally-structured three part storyline, and as such, it's mostly setup: Wolverine is feeling wilder as a result of his recent exploration of his past (a nice nod to the previous story) and knocks boots with Mystique, who's afraid of Spiral, who shows up at the end. 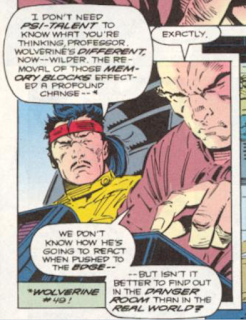 The art from Andy Kubert isn't too off from what Silvestri usually does (helped, I'm sure, by having Green on hand to ink Kubert), helping the art feel less fill-in-y, and it's nice to see Hama doing something vastly different from the previous story (shifting from "revelatory exploration of Wolverine's past" to "hijinks with Mojo" could be jarring, but for now it works just to have the series get out of Wolverine's past for a bit). 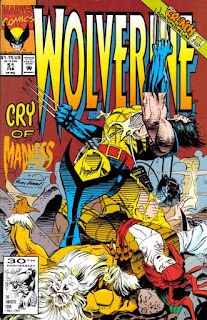 This issue itself is still a bit of slog, as it lingers too long on establishing the idea that Wolverine is wilder in the opening pages (the Danger Room is already, essentially, a virtual reality generator; we don't need scenes of Wolverine fighting in it AND against crude VR representations of some of his Greatest Hits villains to make the point), but it's nevertheless setting up a new story with some promise. A look the first waves of X-Men action figures. It seems pretty clear that Wolverine slept with Mystique in this issue, though it's less clear if he did so while she looked liked Jean Grey. Nah. They talk of changing into something decent just before Mystique steps out as Jean Grey commenting on it and Logan seems to not be amused about it. Spiral seems to be keeping herself busy. Albert & Elsie-Dee actually have me pining for Technet. Yeah. The Danger Room already had essentially magic hologram capability that way outclasses what we see here. "It seems pretty clear that Wolverine slept with Mystique in this issue ..."
***Ha, he slept with his best friend's mom. "Wagner's mom has got it goin' on ..."
" though it's less clear if he did so while she looked liked Jean Grey. Either way, the idea of Mystique posing as Jean and attempting to seduce Wolverine gets used in the second X-Men film as well." *** As soon as that happened in the movie, I flashed back to this issue, which I have always liked, just for the moodiness of it. I was kind of annoyed when the next issue completely changed the tone from moody and foreboding, to all-out wacky. He sleeps with everyone, the man-harlot. Yukio on the rooftop in KP&W. Viper. Everyone.